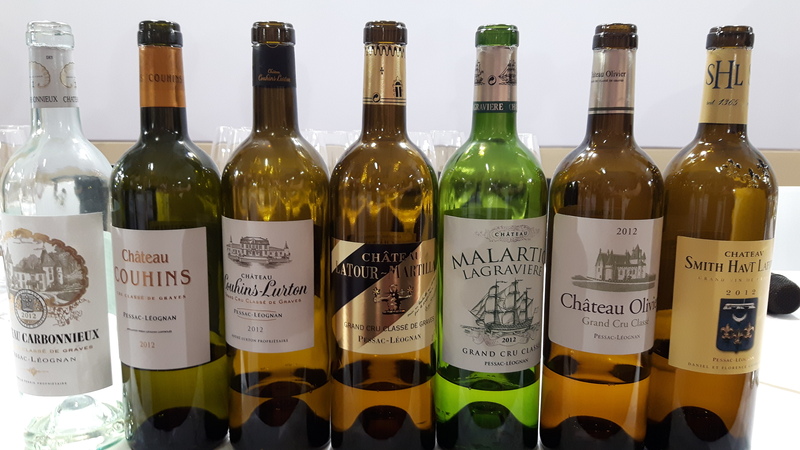 White Bordeaux gets a bad rap…too many people are focused on the top growth (red) Bordeaux, that more often than not, the stunning white wines of Bordeaux, made with blends of Sauvignon Blanc, Semillion and sometimes Muscadelle and Sauvignon Gris, get left to gather dust on the shelf. This is a mistake. Many are well made wines with serious complexity and huge ageability. 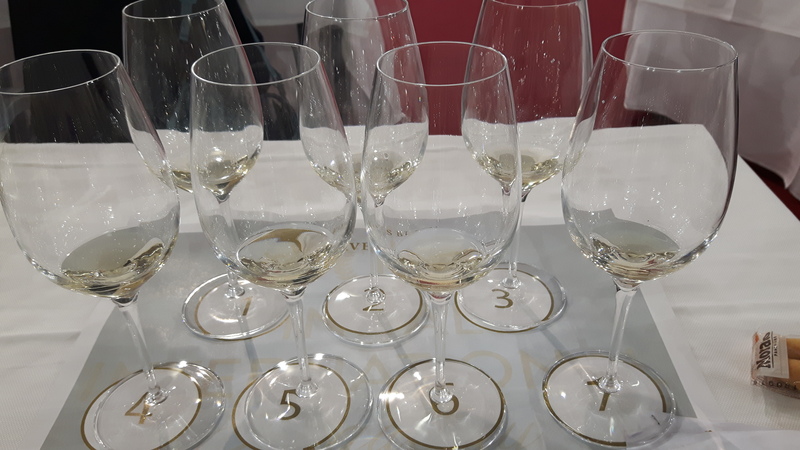 Once again at Vinitaly, I was able to sit in on a tasting of these Wonderful Whites, seven whites with varying blends of the grapes mentioned above, with one of them being 100% Sauvignon Blanc. All 2012 vintage, therefore a (kind of) horizontal comparison of different vineyards of the same vintage. 1. Chateau Carbonnieux 2012 – Classified as a Grand Cru Classé de Graves, this wine is really all about terroir. The winery practices organically, and has a diversity of soils that really bring character to their wine. This wine is grown on clay-limestone and gravel and the “minerality factor” is certainly evident in this wine. Made with a combination of 60% Sauvignon Blanc and 40% Semillon, (in the class we were told it was a 70/30 blend, but upon further research, I have discovered this is an error) this wine is more muted on the nose, but with definite green apple and citrus peel. Medium plus acid and alcohol, it is dry with more green apple, citrusy, steely minerality and some sweet spice as it developed in the glass. 2. Chateau Couhins 2012 – Not the typical blend in this wine. At 95% Sauvignon Blanc and 5% Sauvignon Gris (a mutation of Sauvignon Blanc, and mostly used for blends), this wine seemed more typical of Sauvignon Blanc as many of us know it. (ie New Zealand) Rife with cat’s pee, gooseberry and asparagus, this certainly had more vegetal qualities than wine one. On the palate, it had a light tannic edge and higher alcohol, giving it more body, a fuller mouth feel (also likely due to the lees stirring) and a longer finish. 3. Chateau Couhins-Lurton 2012 – 100% Sauvignon Blanc and one of the stars for me of the lineup. Many might think Sauvignon Blanc as a grape that does not have the ability to age, but with the high acidity, the potential to age is undeniable. This was a pretty wine. Aged in oak on the lees, it had a creaminess to it that I loved. Floral, citrus and minerality on the nose, with medium plus acidity on the palate and flavours of lemon chiffon, acacia honey and toasty oak that was not overt, but pleasant. The mineral complexity will only increase as this wine ages. 4. Chateau Latour-Martillac 2012 – This wine showed well, showcasing its blend of 70% Sauvignon Blanc and 30% Semillon. For many, it’s difficult to think of Sauvignon Blanc as being an oaked wine, because in the new world, we just don’t see that. It is typically a fresher style with many of the aromas and flavours that are prevalent in wine number two. But with the combination of fermentation in wood, ageing in some new oak (25% here) and lees stirring, there is more complexity of flavour, more body and a fuller mouth feel in these wines. These are the aspects that makes me truly love Bordeaux white. I found the aromas to be full of asparagus, citrus and smoky minerality. The palate had really bright acidity, citrus notes of lemon/lime, waxy apricot, sweet spice and high, high minerality nuances with full body and a lively clean finish. Seriously though, with 75% Sauvignon Blanc and 25% Semillon, the complexities on this wine were astounding. Very floral on the nose with fresh green apple, on the palate this wine was creamy AND fresh, with notes of lemon chiffon, apple pie, cinnamon and yogurt. With steely acidity and a light tannic edge, it had a lovely round mouth feel (likely due to the Semillon) and a finish that lingered. I don’t think one would have to guess that this was my favourite of the lineup! 6. Chateau Olivier 2012 – Sidebar: I always double check any blends, ensuring the percentages are correct. Interestingly enough, on the official website for the Chateau, there is no 2012 listed, therefore, I am relying on my own note taking from the class hoping I heard the blend correctly, and then wrote it down correctly! The percentages of the grape blend would change every vintage, but it will always have Sauvignon Blanc, Semillon and Muscadelle. According to the class, this vintage is 78% Sauvignon Blanc, 20% Semillon and 2% Muscadelle, which gives it a slight aromatic lift. This was very herbaceous on the nose with citrus, goosberry and hints of peaches. High acidity, yet lighter body on this wine with strong lemony citrus and green apples with slight floral on the palate. 7. Chateau Smith-Haut Lafitte (non classé) 2012 – The blend for this wine is 90% Sauvignon Blanc, 5% Sauvignon Gris and 5% Semillon. 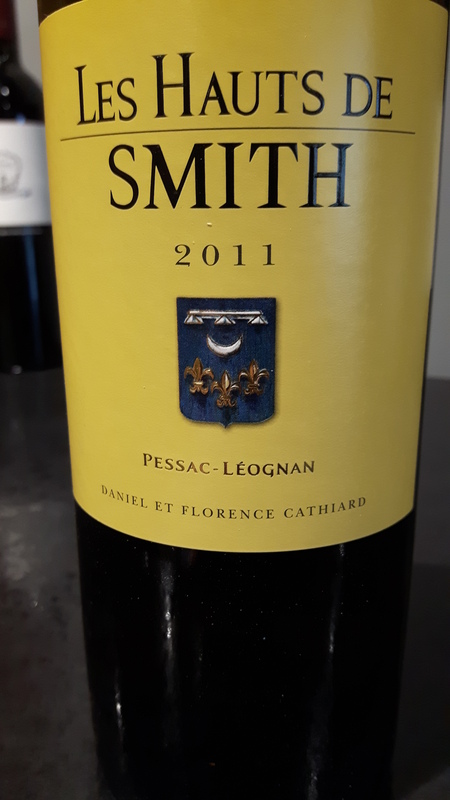 On a personal note, I carry the Les Haut de Smith 2011, (photo to the right) in my store, which would be considered the baby version of the wine tasted at Vinitaly. The Sauvignon grapes are picked at the same time for both wines, and the lots chosen for the lesser Les Haut de Smith are treated with the exact same care and attention as the Grand Vin Smith-Haut. The only difference is that the Les Haut de Smith, is 100% Sauvignon Blanc. For the tasting notes, the Smith-Haut Lafitte had a slight musky note on the nose, along with white flowers and apricots. The oak integration is exactly where it needs to be on this wine. A creamy vanilla note that was not overt, I found this to be another very “pretty” wine that was super balanced in acidity, body and alcohol with a great long finish. This wine was a very close second to the Malartic-Lagraviere. I live in a place where red wines are king and beef is plentiful. The natural thought is to always have a red wine with your meal. But seriously, if you bypass white Bordeaux in favour of red, you might just be missing out on some of the best wine ever made. With oak treatment, battonage, and even some skin contact, there is substantial body in many of these (and other) white wines that could very easily stand up to some of your barbecue this summer. Take a chance! Try something new! Try a white Bordeaux! Salut! A satisfactory tasting of Graves Blanc! This entry was posted in Tasting, Varietals, wine and tagged Bordeaux, France, Grand Cru Classe, Graves, Muscadelle, Pessac-Leognan, Sauvignon Blanc, Sauvignon Gris, Semillon, underrated, white. Bookmark the permalink. I love white Bordeaux and had many exceptional ones at En Primeurs!